Ballistic calculates trajectory, windage, velocity, energy, lead, and bullet flight time for any valid range. Ballistic can compensate for atmospheric conditions such as temperature, barometric pressure, humidity, and altitude (it can also accept density of air or density altitude input). It’s also much more than a basic trajectory calculator. With a vast library of over 5,000 projectiles and factory loads, and advanced features - Mil-Dot and MOA rangefinder with head-up display capabilities, GPS and atmosphere awareness, full size charts, reloading companion, precision target log, and option HUD for mounted firing - Ballistic is a complete precision marksman tool for hunting, at the range, or at home with your hand loads. The world renowned JBM Ballistics computer powers all of Ballistic's computations. JBM is used by world-class shooters everywhere to deliver some of the most precise calculations. You'll even be able to take JBM's extremely accurate calculations with you, even into areas with no cellular coverage. "I shoot on Team Louisiana Precision Rifles in Tactical rifle matches. Everyone on the team that uses Ballistic has had great results.We travel to various states so there is no way you can get DOPE at all the various DA's... This program has really been a game changer." 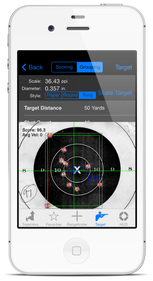 "This is a great ballistic app. It adjusts for environmentals well if your within cell phone service. 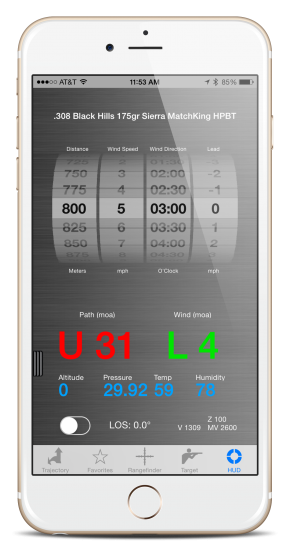 You can always manually input the data from a Kestrel or other weather meters. I really like the way it uses the iPhone for the LOS angle." The JBM Ballistics computer, written by James B. Millard, is among the world's finest ballistic engines in existence. Used by competition shooters, hunters, and the military, this powerful ballistics library delivers precision results. The JBM engine also adds new features such as velocity adjustments for chronograph, optimum point blank range, upwind (z-wind) correction, and midrange/downrange wind sources. 5,000 projectiles, factory loads, military loads, and performance data points from leading manufacturers, military testing, and performance testing. Specify your own projectile properties. Includes the latest commercial data and several G7 military coefficients from Aberdeen Proving Grounds, as well as Bryan Litz custom G7 BCs and projectile length data. The Advanced Wind Kit (tm) takes full advantage of the JBM ballistics engine's wind capabilities to allow pro shooters to account for nearly any possible wind scenario. 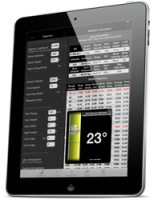 The Advanced Wind Kit (tm) allows users to easily and quickly program in even the most complex wind scenarios for up to eight wind sources. 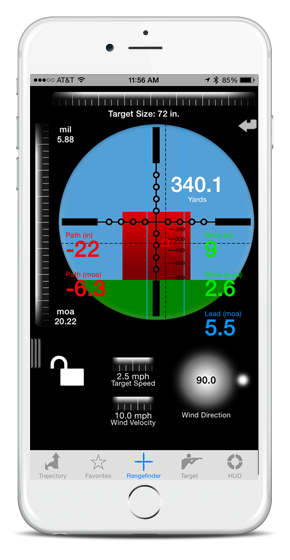 Simply tap to create a new wind zone and then slide it to the appropriate range. Ballistics charts allow you to display the energy, velocity, and drop for your current projectile, or compare up to eight projectiles together on the same screen. Your current atmosphere and zero are automatically applied to all projectiles, so you're comparing apples to apples. Compare bullet path and energy or wind drift. 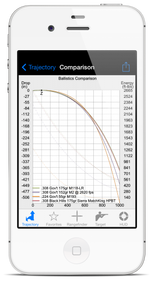 Ballistic will also show you trajectory charts based on altitude or shooting angle. This video will teach you the basics of the Trajectory screen, and what you need to know to calculate an accurate trajectory. This short video will show you how to easily import a photo from the manufacturer’s website to create your own custom optics profile and how to calculate ballistics. Ballistic’s Truing Tool is designed for the shooter using trusted and proven data to automatically calculate minor changes impacting actual muzzle velocity.